If verisimilitude is not a criterion for assumptions, any result can be reverse engineered by picking the assumptions that deliver the result. If any result can be engineered then results themselves have no special ontological status. How complicated can the problems be that we allow our agents to solve in a model? Is a dynamic program ever admissible as a reasonable assumption on the objective function of an agent? That depends on the situation. If the goal that the agent is seeking is sufficiently clear (albeit complicated to achieve) and the agent has lots of opportunity to experiment and come upon something that works well, it may be reasonable to assume that the agents’ actions will converge in a way that it appears as if it is solving such a program. The validity of the “as if” assumption should be vetted in this way though. This entry was posted in Uncategorized on March 28, 2014 by Cyrus. Why do countries work so hard to *lose* their access to World Bank loans? In a new working paper posted to SSRN, Peter Aronow, Allison Carnegie and I propose an answer to the puzzle: by doing so, countries can reap “status” gains that outweigh the material costs of losing access to loans [SSRN link]. The World Bank loans program is an interesting setting for analyzing how international pressures affect the behavior of governments. This is because the terms of loans and other sorts of support that the World Bank offers depend on how a country falls along a fixed schedule of income classifications. The figure above illustrates the classifications as they were applied in the year 2000. Our paper focuses on what happens when countries cross the threshold shown at $5225 GNI/capita in the figure. Here, countries are made eligible for “graduation,” which, when achieved, means that they can no longer receive the type of generosity that the Bank provides to middle income and lower income countries. We reviewed the case histories of countries crossing this threshold and found, quite curiously, that countries seem always to welcome this offer to graduate. The case histories provide no evidence of a tendency for countries to try to avoid or stall graduation even though this means losing access to benefits. 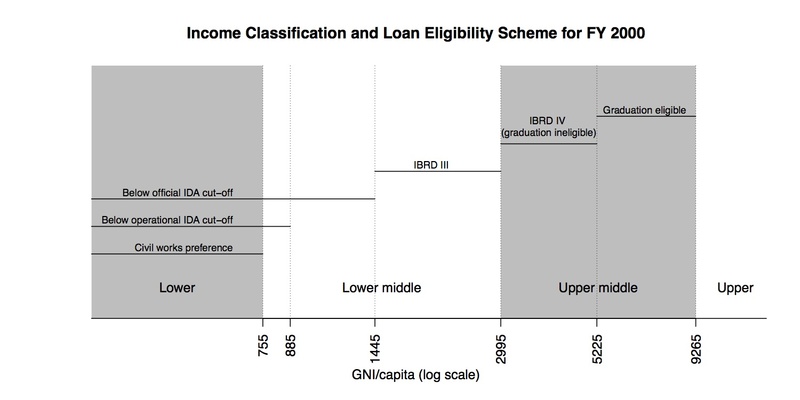 Moreover, the clear cut nature of the classification rules allows us to use a regression discontinuity design to study just how countries react to crossing the threshold—that is, to obtain a very credible estimate of the causal effect of becoming eligible to graduate. We find, remarkably, that countries tend to react by liberalizing. This is not what we expected: we expected to see that countries would react in a manner indicative of becoming extra sensitive to risks, perhaps even by reigning in liberties. We investigated various possible explanations for this seemingly puzzling behavior, and the one that seems best supported by the evidence is that governments view graduation as an opportunity to increase their institutionally conferred status and join the “club” of developed nations. The liberalization that we witness is part of that exchange, given the hegemony of liberal western governments in defining terms of “success” within the World Bank. This entry was posted in Uncategorized on March 9, 2014 by Cyrus.